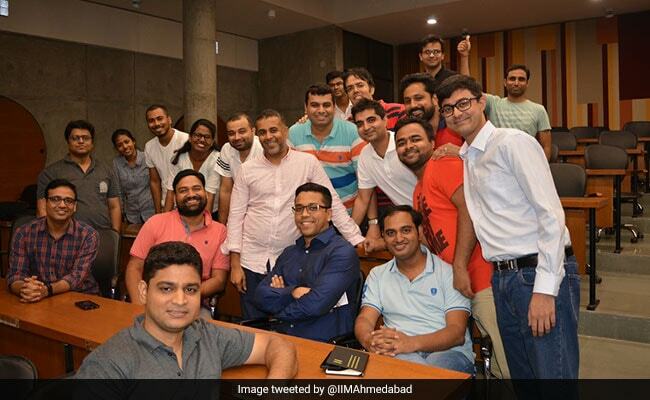 “It’s not that simple to be simple,” author Chetan Bhagat told Indian Institute of Management (IIM) Ahmedabad PGP and PGPX students yesterday at the institute. Mr. Bhagat, also a columnist, screenwriter and an IIMA alumnus, was honoured at the IIMA “Young Alumni Achiever’s Awards 2018” which were presented yesterday to seven alumni from the institute. “I am delighted to receive the Alumni Achiever award from IIMA, which is not only my Alma mater, but also one of the top institutions in the country. So many distinguished alumni have graduated from IIMA, to be honored like this makes it really special,” Mr. Bhagat said while receiving the award. Ms. Anuradha Chugh (currently the MD, Ben & Jerry’s), Mr. Prakash Jhanwar (currently Regional Head – South East Asia and China, Olam International), Mr. Utsav Baijal (currently Partner, Apollo Management/Aion Capital, USA/India), Mr. Kuldeep Jain (Founder and CEO, Cleanmax Solar), Mr. Manish Gupta (Co – founder & CEO, Indegene), and Prof. Ashwani Monga (Vice Dean for Academic Programs and Innovations, Rutgers Business School, Newark and New Brunswick) among the awardees this year. When your own college honours you, it means something else! So proud and happy to be in campus and receive the Young Alumni Achiever’s Award at today. Saari puraani shararatein maaf! “The careers of these aspirational individuals are role models for our students as behind each success is a story of diligence in goal setting and overcoming obstacles in the endeavor to achieve them. In the process they have enriched society in addition to the organizations they have worked in. We take pride in their achievements and look forward to their future endeavors as change agents and leaders,” IIMA Director Prof. Errol D’souza said.